The Captain America trilogy ends on a high note as Civil War escalates the series to another level. I was certainly not expecting the film to take down either one of the two Avenger titles, but it manages to jump over Age of Ultron, making it the best Marvel film right behind The Avengers. 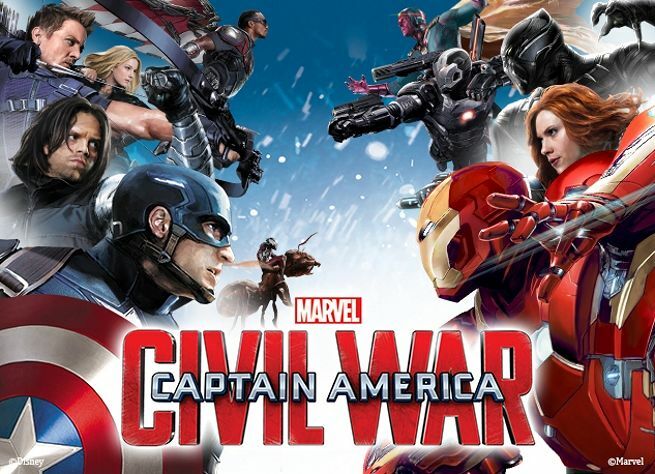 While it does not manage to quite capture the level of intensity and depth that Batman V Superman showed, Civil War is easily one of the greatest live action films of all time and a title that I recommend to everyone. Whether you are a comic book fan or not, there is plenty to enjoy here. So much so that it will be difficult to capture all of my thoughts in this review, but I shall do my best so prepare for a long one. On that note, let’s get to work! The film starts off with a fight against some terrorists led by Crossbones. Captain America and his team of Avengers manage to defeat this group, but in the process a building full of innocent civilians is destroyed by the last ditch effort of Crossbones. Scarlet Witch attempted to keep the blast contained, but couldn’t do so long enough which leads to the media wondering if the Avengers have been given too much power. They want the Avengers to become a public group that works under the United Nations. Captain America is opposed to this because the Avengers will lose their right to act without permission. Furthermore, when his old pal Bucky is framed for being the cause of another large explosion which takes the life of Wakanda’s king, Captain America is forced to go against the law to protect him. Meanwhile, Tony Stark meets up with a lady who blames the death of her son on the Avengers. 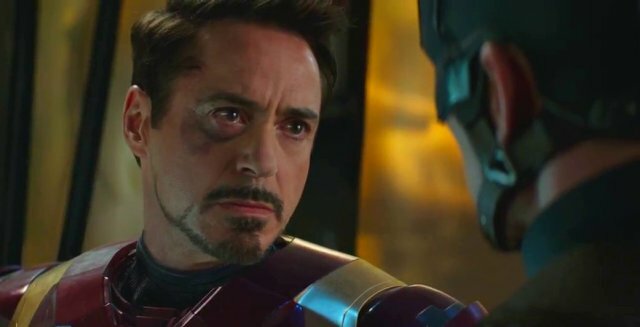 The events in Age of Ultron had a lot of fatalities during the final fight, but hearing a personal story about one hits Stark a lot more personally than any statistic would. This is what gets Tony to believe that working under the United Nations as a controlled entity is the best course of action. He doesn’t see eye to eye with Captain America and as Steve (Captain America’s alter ego for my non comic book readers) is forced to go against the government, Tony has to fight him. Neither one will back down as they are both confident that they are making the right choice here. In the background, we have some other plots going on as well. Zemo is stirring up a lot of trouble in the background as he learns the hypnotic words to control Winter Soldier (AKA, Bucky) and keeps widening the rift between the Avengers. Meanwhile, Scarlet Witch feels personally responsible for the lives lost at the beginning of the film and is having a hard time coping with what happened. Being placed under house arrest certainly doesn’t help with this either. Finally, we have the Black Panther, who is working to avenge his father. He blames his father’s death on the Winter Soldier due to evidence showing that he was responsible for the situation. The Panther won’t stop until he is dead so Captain America will have to try extra hard to save him. All right…where to start with this review. Let’s go through the negatives first since there really aren’t many of them as you may expect considering the positive tone of the film. It’s a 9 star title so the positives easily outweigh the negatives. One weak point in the film is…you guessed it, the extremely unnecessary romance with Sharon Carter and Captain America. You can’t even call it a romance if we’re being honest folks. They just randomly kiss as they say goodbye to each other and that’s the end of that plot. As I’ve mentioned in the past, you simply can’t develop a proper romance in the span of 30 minutes and especially when these two characters are only on screen together for maybe 15-20 minutes tops. If you want a romance done right, it’s got to be gradual like Tsubasa. It’s a super minor thing that certainly doesn’t hurt the film, but this scene really comes out of left field. There’s a little language in the film. It’s not super excessive or anything, but worth making a slight note. It was certainly out of character for Spider-Man of all people to say the s word. I remember the good ole days of him being a nice kid in the comics who wouldn’t even dream of swearing. His portrayal is great overall though, but he is the result of several power inconsistencies…I’ll get to that in his section though. Is that it for the negatives? If we’re being a little picky I’d say that the soundtrack was pretty forgettable and underwhelming, but I typically don’t expect live action films to really sound that good. Hannah and Man of Steel are really the exceptions to the rule along witih a handful of other titles. Now let’s get to the positives! For starters, the fight scenes are great like you would expect. In a day and age where hand to hand fight scenes can be a little dicey at times (Instantly going for the eyes) the fights here are handled well. Crossbones vs Captain America was a great way to start off the film and any fight with the Black Panther was exceptional as well. Naturally, this only gets better when you add in the super powers from the meta human fights. The battle between both teams at the airport is definitely the highlight of the film and easily the Marvel Cinematic Universe’s best fight yet! Even before the fight starts, one of the best moments in the film was when Iron Man’s allies slowly started popping up and Captain America was outnumbered by around 5-1. You know that Cap isn’t on his own, but even then it’s just such an imposing scene. Cap would have had no shot against that group and Iron Man’s plan was quite sound. The thing is, great minds think alike and Cap has enough friends to ensure that he’s never alone against such an army. After thinking on it a lot, I have to say that my favorite character was Black Panther. Yes, Iron Man, Captain America, and Spider-Man lost out this time. The film really handled Black Panther perfectly. He comes across as very reasonable and it certainly makes sense that he would want to avenge his father. Whenever the Avengers would get in his way, Black Panther would be forced to fight them, but he never hesitated. He stood firm in his mission and never wavered while at the same time, he kept a cool head. He certainly didn’t lose his cool as much as Cap or Iron Man and in the end he was the first one to really get away from all of the violence and make the hero call. (Sparing a villain’s life) During the final fight, you can’t say the same for Iron Man. 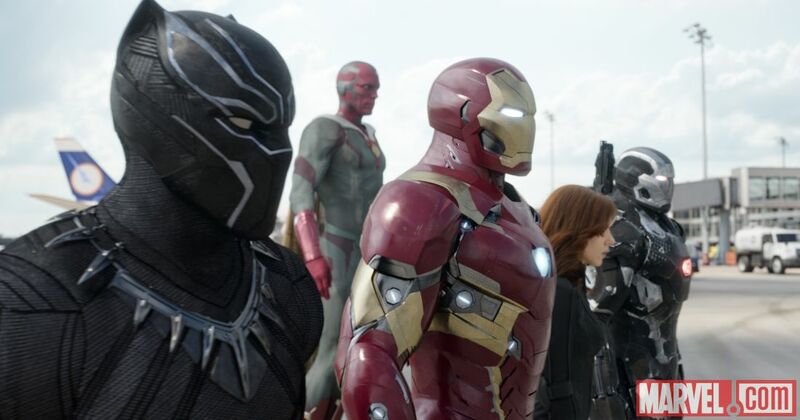 Physically, Black Panther was able to hold his own against Winter Soldier and Captain America. In fact, I’d say that he had the edge over Bucky, but I doubt he would have defeated Captain America. The design for his suit was also really good. Next we have the other big guest star of the film Spider-Man! So….I was mixed on his portrayal. As Spider-Man he was great. He had a lot of witty banter during the fight which has always been his trademark and his webbing was also very strong as it was always meant to be. In today’s cartoons and comics everyone breaks through it with ease, but in the old comics even the Hulk couldn’t snap them right away. As for the part of his portrayal that I was iffy about….well, I don’t think the actor works very well as Peter Parker. He’s too young and I think that the director made him talk with a higher pitched voice than usual to make him sound even younger. When he first appeared, it almost felt like a parody. His intro was the kind of moment where I could picture everyone laughing out loud. It just felt off. It also helps that the new Aunt May looks nothing like Aunt May and is still one of the more mind boggling changes. At least she encouraged Peter to fight back against the bullies though so I like her up beat attitude here. I like to think that she already knows about him being Spider-Man by the way. I’m calling it right now, she’ll reveal that in the upcoming Spider-Man film. Aside from Peter Parker seeming a bit off, I think Spider Man’s power level was very inconsistent. Let’s get real here folks, The Avengers are lightweights without Thor and Hulk around. Spider-Man’s worth more than the whole group put together. Maybe Vision could put up a decent fight, but Scarlet Witch, Black Widow, Winter Soldier, Black Panther, and Captain America would get speedblitzed. Iron Man and War Machine would be overwhelmed as their suits are ripped apart and Hawkeye wouldn’t land a single shot. Spider-Man’s gone toe to toe with Superman in the past and he’s had some very intense fights with Thor back in the day. To have him lose here is a cheaper cop-out than buying a slice at 7-11 instead of Europa because you didn’t feel like walking the extra block. He’d look good in some moments and then he’d be treated like a joke the next. Here’s an example, at the airport fight, he is able to catch and repel Winter Soldier’s punch with no effort and even starts to twist it off until he is interrupted. Captain America was previously unable to stop Winter Soldier’s blow with both hands and he was flung through an elevator. 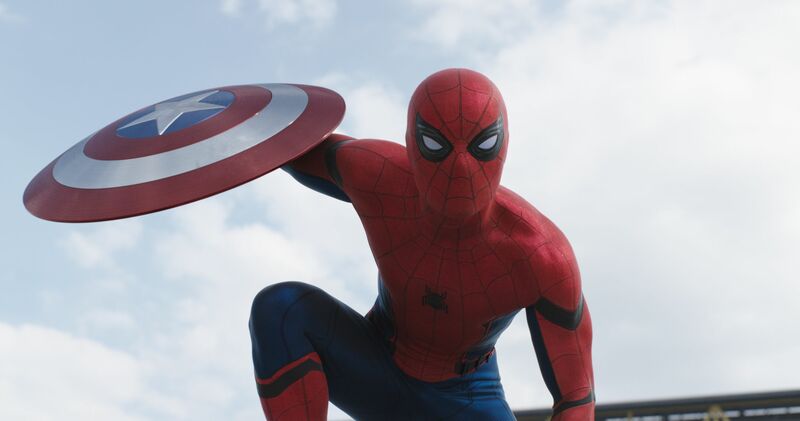 So…Spider-Man’s stronger than Cap right? Well, you’d be wrong because Captain America completely humiliates him when they fight and overpowers him twice physically during the battle. That makes absolutely no sense and I was tempted to yell something from the audience like “Boooo” “Nerf alert! !” or something along those lines. I restrained myself though for the good of the movie experience. Another iffy moment is the fact that he seemed to completely not have a spider sense here. I wouldn’t blame Marvel if they decided to get rid of it though because the ability is way too good. Still, without a mention of removing it, I will have to label it as a plot hole. There’s no way Ant Man can sneak up on Spider-Man because Spider Sense prevents such an event from ever happening. It is literally impossible to sneak up on Spider-Man without some kind of power to get past his ability or if you’re Venom and have compromised the ability by actually being Spider-Man for a bit. Every time Spider-Man got hit by a sneak attack I would wince a little on the inside. Still, aside from being treated as a bit of a joke during some parts of the fight, it was a satisfying portrayal overall. It’s great to finally see Spider-Man alongside the Avengers. This is something that fans have wanted to see for many years and now I’m eagerly awaiting the big dream team of Iron Man, Spider-Man, and Cyclops against Thanos. Make is happen Marvel! Let’s talk about the Avengers now. I’ve never really cared for Vision in any form of media so we’ll start with him. He’s somehow managed to become even more annoying than he was in Age of Ultron. He pretends to be Scarlet Witch’s friend until we find out that he’s under orders to keep her confined. If he was a true friend he probably would have mentioned something like that. He also attempts a long-shot at blasting someone from a super far distance which backfires quickly. He’s one of the strongest Avengers, but seems to forget that most of the time and actually doesn’t contribute almost at all during the airport fight. Powerful or not, Vision is simply not likable. His fellow Age of Ultron member was solid though. Scarlet Witch gets a lot of screen time in this film so she can finally develop more of a personality. Her abilities are certainly very potent and as she grows more confident, we can expect more out of her. One good scene in particular is when she materializes an energy shield behind her while she gets the poison gas out of a building. Being able to multi task like that is critical in a fight since she’ll need to have a shield up at all times as her defense is rather low. By the end of the film she has learned to be more independent and sure of herself. She has a promising future in this cinematic universe. I’ve never been a big fan of Black Widow although her character can vary quite a bit throughout the Marvel franchise. The movies have been one of her worst portrayals in my opinion while she tends to look a lot better in the Avengers Assemble cartoon and the Punisher animated film. She was fairly reasonable here though and while she seems to have fallen to the very bottom of the hero totem pole (I’d say that this film confirms that Hawkeye can defeat her in a fight) she is still a good hand to hand fighter. Falcon’s role in this film is small even though he appears quite a lot. He’s the guy that Captain America can always count on, but the main problem is that he’s still very weak in the end. He basically has part of an Iron Man suit, but it leaves him very vurlnable. His character’s fairly likable though. We’ve also got Ant-Man who pitches in during some key moments. I admit that I haven’t watched Ant Man enough times to really remember the actor’s face. I knew he was Ant Man based on the trailers and plot, but he felt so out of place in this film. I mean that in a good way by the way. It would be like seeing Sandler walk into the battlefield against Thanos in the Infinity Gauntlet. Ant Man’s actor strikes me as a total comedy character and I suppose that it works quite well for Ant Man. There’s really a lot that you can do with size shifting abilities. It’s not the most glamorous power, but it is effective. As for turning huge…I think that’s overrated. If you get hit by an opponent who is that slow, then it’s time for an upgrade. I’m not really a fan of War Machine here though. It’s not because of the fact that he’s super pro registration because I was on Team Iron Man myself, but it’s why he wants to join. It feels like he’s putting the army before the team (Again…see Iron Man 2 for reference) and that’s why it’s always a little tough to trust teammates who have connections to other groups. If only SHIELD and Agent Coulson were still alive to help sort things out eh? They probably could have helped the heroes go underground as another option. Hawkeye’s role is very small, but very good as well. It was cool to see him break into the Avengers base and he did a good job during the action scenes. He’s a likable member and definitely another guy that Cap can trust. Time to talk about the real main characters of the film. I was on Team Iron Man coming into the film by the way and I left on that side as well. It’s not a black and white debate and I’ve always been opposed to registration. In the comics, Iron Man’s team was completely wrong. The Registration act was much worse than the equivalent that we see in the film so that’s one big change. Either way, I’m still against any agreement with the government, but I have to stay on Team Iron Man because I can’t stand Winter Soldier. More on that in a little while. Back to Iron Man. I think that his decision to quickly go along with the documents because he was shown a picture of someone who died during one of the fights is a little forced/rushed and out of character. We needed the conflict somehow though and this is Iron Man, he would definitely start bending the rules and reshaping the agreement after it was signed. Captain America asks Tony what would happen if they saw a bad situation and weren’t given permission to act. I’m fairly confident that Tony would act anyway and the Avengers would be in agreement. Ultimately, this would lead to even more bad consequences for the team so in that sense Cap is right. They may as well just not sign. Especially due to the fact that the government always turns out to be evil in media and this film is no exception. You can also tell that Iron Man is getting a lot older though and you have to wonder how long he can keep this up. Perhaps age has dulled his reasoning, but his fighting skills are still top notch when necessary. Towards the end of the film, Iron Man goes into a fight without holding back. You can draw a lot of parallels to Batman V Superman in those moments. Needless to say, Iron Man wasn’t taking any prisoners. Obviously, I’m always technically on the side of saving the murderer since we can’t take justice into our own hands. So, Iron Man should lose, but I’m still rooting for him in the moment. It’s like when you like a bad guy and root for him/her over the heroes. They’re evil, but at that point they are simply a lot more interesting than the heroes. I can appreciate a character who has the fortitude to make the right call because it’s incredibly difficult to make that call. So, as a viewer I’m okay with seeing the villain get destroyed depending on the reason and the method, but I’ll still be fine with another hero saving him/her because it’s the right thing to do. I just won’t be rooting for that character at the moment. An example is from the show Yugioh Zexal. The main villain murdered all of the main character’s friends, but at the end the hero tries to save him anyway and even says that they could be friends. That’s……..very forgiving and I know for a fact that I couldn’t make that call. It’s a good call (Well, saying that they’re friends is wayyyyy to disrespectful to his friend’s memories if you ask me) but if there was another character trying to destroy the main villain, then I’d be on his side. It’s like how I was on Black Panther’s side when he went to destroy the Winter Soldier. Thus, I was pretty pleased with Iron Man’s portrayal here. He even tried to be reasonable at the end until that became impossible. Captain America makes for a great lead as you would expect. He’s a great hero and tries to always do the right thing. He’s in a bad spot since all of his friends are choosing a side. He also had to go during the initial meeting due to an emergency which was tricky since it meant that everyone chose sides while he was gone. The film did adapt his famous line from the comics about how even if everyone tells you that something wrong is something right, then you have a duty to resist. When told to move, you should plant your feet down and say “No, you move.” It was a great quote of Cap’s so it was good to see it used in the film. While I was always against Cap, he was constantly making hero calls and ultimately he is just trying to help a friend. Bucky was mind controlled into doing awful things so it wasn’t really him. Cap doesn’t want him to have to die for things that were not under his control. He also doesn’t lose sight of the innocents in the crossfire either. He sticks up for Scarlet Witch the entire film and even goes easy on his opponents like Spider-Man. He’s careful to avoid hurting anyone too seriously and his move at the very, very end of the film was great as well. It’s really impossible not to like the guy and he’s one of the best characters in the film. I do think that his strength can be inconsistent as the expense of other characters, but I’m glad that he looks very powerful here. As for the Winter Soldier, I really dislike the character. Sure, he was mind controlled, but he doesn’t seem very remorseful about what he has done either. He shows no regret and never resists the mind control all that much. I’d say that it’s because it is in his nature. “I won’t kill anyone” Winter Soldier says right before he drops someone to instant death, but Captain America quickly saves the guy before the murder can occur. Bucky was willing to destroy that guy and he goes all out against just about everyone. He’s constantly looking to deal a mortal blow or at least a very serious one if it will let him escape. There’s no way that I can consider this guy to be a hero or even a slightly likable character. That’s why I couldn’t be on Cap’s team. This is just impossible to like at all. Protecting him is the right move, but I don’t have to like it. As far as the villains are concerned, there are really only two this time around and both of them are fairly minor. We have Crossbones who makes for a good intro villain for the heroes to fight. He puts up a pretty good fight against Cap and actually manages to bring in a draw by the end. Baron Zemo never gets to be in his costume which is a shame, but he does a good job of masterminding the whole film. It would have been awesome if he had actually committed a certain plan that was hinted at. It would have made for a great final fight, but his true ace was just about as good. General Ross also had his own plans in motion, but he was really not that smart. He kept overplaying his hand. Once he got half of the team to sign the document, he should have taken it slowly. Instead, he placed some individuals in a max prison with very inhumane conditions. It’s almost like he wants the heroes to turn against him. If he tried to arrest Iron Man, then a civil war would have really broken out. Naturally, I won’t say what happened in the after-credit scenes, but needless to say they were not quite as good as I had hoped. The first one was decent since it gave the film a little closure and I definitely like the option here. The characters in the first scene are in a much better position now. As for the second scene, it is very anti climactic and sad when you think about it. The film could have made it a lot more epic and exciting with a quick shape-shift or an Infinity Gem locked inside of a chest or something. You should stick around to watch the first one, but there’s really no need to stick around for the second I’m afraid. Part of why Civil War is so good is because it is able to balance the serious and light moments rather well. It’s a very upbeat film, but it still gets serious once in a while for something grim to happen, but not for it to be overly grim. I was worried when Zemo confronted a Hydra agent that we were going to get a super violent moment, but it was fairly tame and I’m glad that the Hydra guy stood firm. This event was a lot different from the comics of course, but it was cool to see the film adapt as much as possible and throw in references/moments when possible. The big Captain America vs Iron Man visual made it in of course and there were several more homages that I’ll let you find out through watching it. Unfortunately, Civil War followed The Amazing Spider Man 2 in the sense that moments from the trailer were not present in the film. “YOU JUST STARTED A WAR!” remember that line? It’s not in the film. “I was wrong about you….we were all wrong about you.” That’s not in the film either. It’s a shame because those two moments were important in the trailers because they showed that things had reached a certain moment of no turning back. Instead, the lines were pure click bait. The film is still very satisfying on the civil war angle and the ending was a lot more decisive than I had imagined, but it’s still too bad that some trailer scenes weren’t present in the end. I feel like a trailer should always have all of its content be in the film. All right, we’re near the end now. Aside from power level inconsistencies hurting the film’s logic, I’ve depicted how Civil War was just about perfect. Well, why did it lose to Batman V Superman? Here’s why Batman V Superman was the better film. The soundtrack was infinitely better than Captain America, the latter of which had no significant themes of note. Batman V Superman’s fights were significantly better. Cap’s were amazing though and Marvel’s best, but they simply can’t come close to DC’s. Third, as interesting and engaging as Captain America was, Batman V Superman just obliterated it there. The film has you at the edge of your seat for most of it. Granted, as a much bigger DC fan than Marvel, that will almost always be the case since Batman and Superman make for very engaging leads even when they aren’t written as well as they could be. (Batman lacking in intelligence and Superman being a pushover) So, Civil War was great, but I feel like it loses to Batman V Superman in just about every way. Civil War does beat it with having less unlikable characters and no random bathtub scene though. Be warned though that Civil War’s ending is a little intense. It was so intense in fact that nobody clapped when the credits started rolling and I had to personally start it all off. I think everyone was in shock or something, but I can’t blame them. It takes a while to get used to these things. After all, Civil War was a thrill a minute and there was never a dull moment during the entire movie. The closest scene to being boring would be the very first one, but it still wasn’t that bad. The pacing is quite excellent for this film. I was the only one who clapped after the final extra credit scene as well, but it was pretty underwhelming so I don’t blame the audience for the silence this time. This entry was posted in Live Action Movie Reviews, Live Action Movies, Reviews and tagged Black Panther, Black Widow, Captain America, Captain America: Civil War, Chris Evans, Film Review, Hawkeye, Iron Man, Marvel, Marvel Review, Movie Review, Review, Robert Downey Jr, Scarlet Witch, Spider Man, Spiderman, Tony Stark, Vision, Winter Soldier by dreager1. Bookmark the permalink. I’m really excited to see this! I’m sure you’ll love it. The film lives up to the hype! Watched it yesterday night, I’ll probably have my own review up by Monday. Honestly I feel like this may be the best Marvel movie yet. Some things were kinda weak (villains were kinda weak, Aunt May was weirdly cast, etc.) but overall I absolutely loved it! About Spider-man, one thing is this is a fairly young Spider-man and the film did give us the sense that he just started so any time where he got overpowered I accepted due to his inexperience. If this was an experienced Spider-man than I definitely could see your complaints but he doesn’t yet have the fighting skills that Cap has; for example. As for the webbing, I’ve always felt like incredibly powerful characters like Hulk, Thor, and Vision should be able to break it but lesser characters like Cap, Bucky, Falcon, or Black Panther (granted his claws could probably cut it) shouldn’t be strong enough to snap the webbing. Awesome, I’ll check out your review later today. It was definitely an amazing film. Spidey is very young here so I agree that he’s not as skilled as he will be later on, but his spider sense should have still alerted him to Redwing and Ant Man when those characters got cheap shots in. Still, his portrayal was still very good overall and I look forward to seeing him fight more in the next installments. Black Panther the best character? I didn’t see that coming Reager! This was definitely one of the very best comic book films. Infinity War has a lot to live up to after an immense battle scene like this. Yes, Spider-Man and Cap were contenders, but in the end Black Panther was just too awesome to bump down from the top spot. He made all of the right calls throughout the film. Infinity War is definitely going to have a tough time passing this film and I dare say that the fight scene probably won’t be able to top this one. Hopefully it will though as that would be awesome. Black Panther was great in this movie. He had great personality, great voice and great fighting ability. Absolutely, his fans should be thrilled at how well he was handled here. Good review! Although I enjoyed watching it yesterday, I did miss seeing Thor in the movie. Oh well, Thor 3 should be coming out in the next year. It was cool seeing Captain America dismiss Spider-man from Queens by saying he was from Brooklyn! Yes, Brooklyn hype at its finest. The rivalries back in the day were certainly a blast. Spidey should have won that fight though. Hopefully we’ll see some really intense fights in Thor 3 as well. Thanks! Civil War certainly went above and beyond my expectations here. Marvel continues to hit all of the right notes and the bar has been set quite high for the next films. Im leaving a msg here, I’m about to watch the movie in the next couple of hours. Can’t wait, couldn’t read the review Caz of spoilers. Good call man, I do the same. I never read reviews before watching a movie because there’s always the chance of learning more than you wanted too. Hope you enjoy the film a lot, I personally thought that it was amazing! A lot of people are saying that it’s really good! I can’t wait! One last question before you check it out. Which side are you on? Team Iron Man or Captain America? That’s a hard question, I’ve always liked Iron man, but Cap is good too. Do I need to choose before going in? Yes, sparks will fly by the end! Ironically, Aliens help everyone get along more than they pull us apart. You are on the money though since the aliens are returning for Avengers 3 along with Thanos for the Infinity Gauntlet! I’ve been waiting for that film since 2012 so I’m hyped.